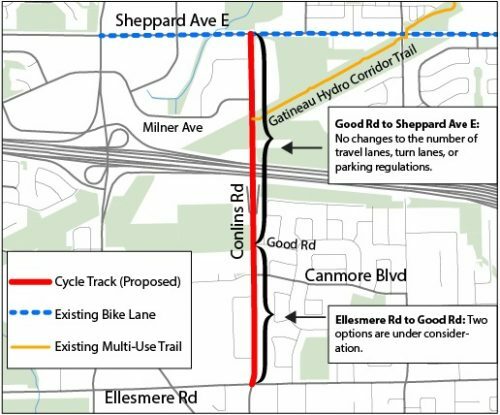 The City of Toronto is planning to upgrade the existing bike lanes on Conlins Road between Ellesmere Road to Sheppard Avenue East to cycle tracks (bike lanes that are physically separated from traffic). This work would be done as part of already scheduled road resurfacing on Conlins Road later this year. The new cycle tracks will provide a safer and more comfortable connection for cyclists and improve connections to the Gatineau Hydro Corridor Trail and Sheppard Avenue bike lanes as well as future cycling routes planned in the area. The upgrade to cycle tracks may also result in changes to on-street parking. Please view the display panels then fill out our online feedback form. It will only take 2-5 minutes to complete. Please submit your feedback before April 23, 2019. We invite you to attend a public open house to learn more about the proposed design options, ask questions, and provide feedback. Between Good Road and Sheppard Avenue East, the existing travel lanes are proposed to be narrowed to provide space for a buffer and physical separation for the bike lanes. No changes to the number of travel lanes, turn lanes, or parking regulations are proposed. Option 1: Remove all on-street parking to provide space for wider bike lanes, buffers, and physical separation. Option 2: Move existing bike lane (northbound) to be next to the curb and position the parking lane between the bike lane and travel lane. The existing lanes would be narrowed to provide space for buffers and physical separation. This option retains approximately 18 parking spaces on the street which exceeds the maximum observed parking demand. The Ten Year Cycling Network Plan was approved in-principle by City Council in 2016 to connect, grow, and renew cycling infrastructure throughout Toronto. The planned road resurfacing for Conlins Road provides an opportunity to renew and upgrade the existing bike lanes, consistent with the objectives of the Plan.